Optical Sorting Machine is a sorting technology of any bulk material based on the product analysis by color.Recently this technology has been recognized by many China Color Sorting Machine manufacturers.Zhongke Color Sorter is one of them who has core technology. Pecan,Pistachio,Sunflower,Poppy and s and so on.Our Optical Sorters sucessfully meet the needs of non-food industries,like recycling of glass and plastic ,as well as sorting of wastes,salt and minerals. 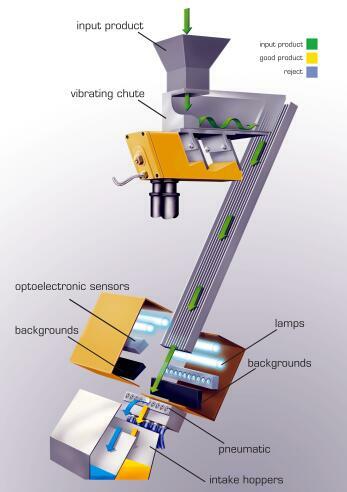 Standard procedure of optical sorter's operation can be described as follows:Input material is loaded in the sorter via in-feed hopper.With the help of vibration the material flows along the chute to the distribution channels.Then the product gets into the inspection zone,where is is checked by the CCD cameras.Cameras ,having capature the picture of selected material,generate electric signal for computer operating system.Depending on the signals received form the optical system,the computer control system sends the commmand to the open the ejector which blows away the bad material in different color.The good product directly flows into the goods product hopper,The reject is blown off to the discharging hopper. 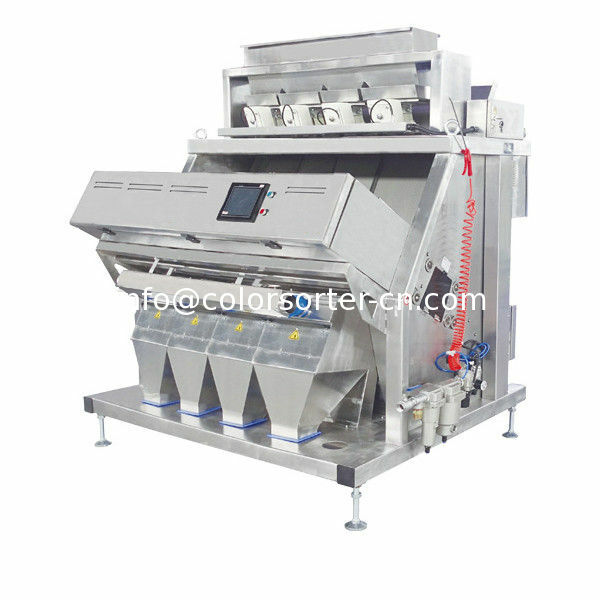 Color Sorting Machine have the re-pass option ensuring more accurate sorting of the grain and minimizing losses of the good product. The optical sorter has great performance in sorting sea salt and rock salt. Slightest color and brightness differences,for example white/light and dark grey as for anhydrite or slightly brown shades as for sulphur,are relibaly detected and are available as sorting parameters. 2,The material yield is maximised by accurate detection and exact sorting. 3,Effective corrosion protection with special powder coating as well as the use of special stainless steel ensure long-term operation with long endurance. To get more updates,please subscribe our YouTube channel.